Managing supply chains in the IoT era is not just another evolution of previous technology platforms. Leveraging IoT for supply chain management requires new ways of thinking and new kinds of software platforms to take full advantage of the opportunities that IoT brings to supply chain management practices. There is the potential to move from a reactive “fire-fighting” model of supply chain management to a pro-active stance based on continuous predictions and action based on real-time IoT analytics. But doing so does require careful consideration. 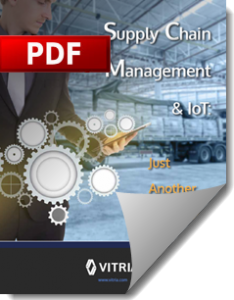 Read this whitepaper to learn how supply chain management will change dramatically in IoT…and how analytics can help transform your supply chain!